When was the last time you showed off your bare legs? Do spider veins on your legs make you hide them from a walk in the sun? Sclerotherapy is effective in removing unsightly spider veins and small varicose veins. It's a great way to give you back the confidence to show off your legs! Spider veins are very small blue, purple or red varicose veins that lie just beneath the skin. 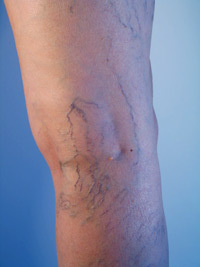 They tend to occur in people with family history of varicose veins or spider veins. They become more common with aging, in occupations that require standing, and after pregnancy, or with excessive weight gain. What Can be Done to Remove Spider Veins? Sclerotherapy is used to treat spider veins and some smaller varicose veins. A solution called a sclerosant is injected into to veins causing inflammation that makes the veins scar and collapse. Eventually the body reabsorbs the treated vein and the blood flow is redirected to other healthy veins. This process occurs over several weeks, so it takes time to see the final benefits of treatment. Depending on how many spider veins are involved, more than one sclerotherapy treatment session may be necessary. Sclerotherapy is an affordable treatment for small varicose veins. While varicose veins are considered a medical problem when they are causing pain or swelling, spider veins and the smaller varicose veins are generally considered a cosmetic problem. Most spider vein treatments will not be covered by insurance. If you have varicose veins, they will need to be evaluated and treated before we can treat the spider veins or they could come back. Most varicose vein problems are covered by medical insurance. Start planning to bare your legs now! We have several office locations available where a consultation may be performed by one of our vascular specialist at your convenience. Call us at (315) 464-VASC to schedule your consultation appointment today.